MMS/aidsfocus.ch - Since last year MMS/aidsfocus.ch has been part of the Swiss delegation to the Board of the Global Fund to Fight AIDS, Tuberculosis and Malaria (the Global Fund). The Swiss are part of the Canadian and Australian constituency. The three countries combined have one voting seat and aim to contribute to and influence Global Fund policies and practices. MMS/aidsfocus.ch’s role is to represent the civil society perspective related to the work of the Global Fund within the Swiss delegation. Global Fund to Fight AIDS, Tuberculosis and Malaria was founded in 2002 and is perhaps the most important and innovative health initiative developed in the 21st century. It was created to radically increase the resources to fight these three diseases. As a partnership between governments, civil society, the private sector and affected communities, the Global Fund represents an innovative approach to international health financing. The Global Fund raises and invests nearly US$4 billion a year to support programmes in countries where the disease burden is high. The Board is the Global Fund's highest governing body. The Global Fund Board includes 20 voting members with equal representation for implementers and donors. Non-governmental organisations are represented by the developed country NGO Delegation and the Developing country NGO Delegation. The Communities Delegation comprises members who are living with HIV and/or have/have had TB and/or are living in or working with communities affected by malaria. Their ultimate goal is to influence the Board's decisions with regards to increased access to quality prevention, treatment, care and support for communities living with and affected by the three diseases, following the principles of equity and human rights. The following paragraphs highlight the development of the new Global Fund strategy for 2017 to 2022, the consultative processes which have led to the framework, and the main focuses of the NGO delegations. One of the overarching topics for the Global Fund in 2015 was the development of the new strategy for 2017 to 2022. Many consultations, meetings and debates took place around the world to gather the different regional perspectives (see graphic 1 below). A highlight for us was the Buenos Aires Partnership Forum in September 2015. This forum was the last of the three regional consultations organised by the Global Fund on the new 2017-2022 strategy and the main issues relating to it. It was designed for Central and South America as well as Eastern Europe and Central Asia. Around 100 participants took part, mainly from NGOs and civil society organisations, with three donor representatives (USA, Switzerland and private foundations), and some parliamentarians (European Union, Canada, Barbados). During this third Partnership Forum, since most countries in the region are transitioning out of Global Fund investments due to moving towards Middle Income Country (MIC) status (based on the World Bank classification), the issue of the sustainability of Global Fund supported activities was at the top of the agenda. Most people living with HIV live in middle-income countries. 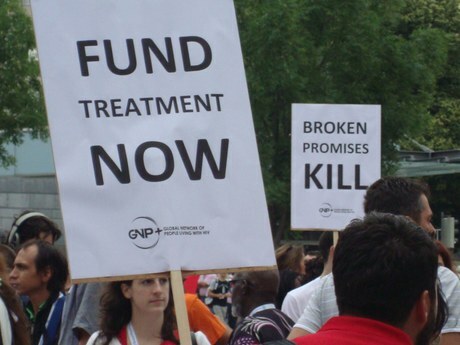 CSOs argue that the Global Fund's sudden and unpredictable exit as an investor in these countries will put at risk the achievements made in terms of better health systems, community systems, and progression on epidemiological and health results. Such consequences have already been observed in those countries which have experienced a sudden cessation of Global Fund investments due to the change in their income status. The Communities Representatives advocated for continuous engagement with human rights. The need for a stronger consideration of the requirements of “key populations” and the credo of “leaving no one behind” ran through all the discussions. There was also a consensus that the strengthening of health systems and community systems plays a key role in the fight against the three diseases. This new strategy is expected to be adopted by the Global Fund Board in spring 2016 in Abidjan, Ivory Coast. The consultative processes with various multilateral consultations, meetings and dialogue and partnership forums have significantly contributed at regional and national levels to the outcome of the strategic framework for 2017 to 2022. The latter has largely evolved from the current framework and is based on the challenges of a changing landscape. First and foremost, the strategy's focus will be to align with the Sustainable Development Goal of ending the three diseases by 2030 (SDG 3.3). The strategic objectives originate from this primary goal. The strategic framework for 2017 to 2022 was adopted at the meeting of the Board in Geneva in November 2015. Its aims are to invest to end the three epidemics focusing on four core areas: 1) maximise the impact of the fight against HIV, TB and malaria, 2) build resilient and sustainable systems for health, 3) promote and protect human rights and gender equality and 4) increase resource mobilisation (see Graphic 2 below). The civil society organisations (CSOs) strongly advocated for greater support for programmes in the new strategy that promote and advance human rights and gender equality. Gender-based discrimination and violence, punitive laws and discriminatory practices against people living with and affected by the three diseases pose significant barriers to the availability, accessibility, acceptability and quality of medicine and services. At national level, as well as within the Global Fund itself, gender inequality (as a driver of the three diseases and a cause and consequence of violence) has not been consistently addressed, something which can be observed within weak national policies and programmes. Achieving gender equality requires political will and financial resources. The CSOs urge the Global Fund and its partners on the Board, including donors and technical partners, to better support and engage in dialogue with governments to improve the legal and policy environments of key affected communities. They would like to see stronger commitments to encourage community-based responses and to build capacity and also stronger support for the role of CSOs in advocacy, accountability and implementation. One of the main issues which has been highlighted, including at the Partnership Forum in Buenos Aires, is the transitioning and sustainability of programmes in countries no longer eligible for Global Fund investments due to their World Bank classification as a Middle Income Country (MIC). In the next 15 years at least 24 countries will be phased out of Global Fund investments in at least one disease area (e.g. Thailand, Ethiopia, Kenya) and 15 countries have already transitioned in the last 4 years (e.g. Argentina, Brazil, Croatia). The civil society organisations have repeatedly raised concerns about those countries where the government will not continue to support HIV programmes. The CSOs particularly criticise the Global Fund for inadequate planning and failure to support such countries via clear guidance and technical expertise for the transition phase. The NGO delegations have urged the Global Fund to develop an overarching sustainability and transitioning policy. They ask the Global Fund to assess a country’s readiness, willingness and ability to transition to decreased levels of funding and to remain engaged with those programmes until they can be sustained without Global Fund support. Planning how these programmes can be sustained once the Global Fund withdraws from a country or is anticipated to withdraw must start at the beginning and is not a matter of money alone. Political will is required to increase domestic resources. For MMS/aidsfocus.ch it is a privilege to be part of the Swiss delegation and to be close to the strong advocacy movement in the Global Fund. It opens eyes and doors to civil society movements around the world. Note: In many Global Fund communications you may find that the new strategy covers the period from 2017 to 2021. However to align the new strategy to the start of a replenishment and allocation period the Board decided in November through an electronic vote that the new strategy cycle covers the period of 2017 to 2022. The Global Fund. Key themes and positions on the Global Fund Strategy 2017-2021 as stated by civil society representatives from Eastern Europe and Central Asia . (2015).